How I Gained It: I’ve never been what you would call small. The smallest I ever was was in college when I wore a size 10. After I met my husband and got married in 2001, I really packed on the pounds. He likes to eat, so I would eat with him and over the years all of that food added up. I would eat a lot of fast food and fried foods. I didn’t eat a whole lot of fruits and vegetables. I have a weakness for chips, fries, pastas, breads. When I would get bored, I would eat. If I was sad or upset, I would eat. I would take a bag of Doritos and eat the bag in about two days while watching TV. A can of Pringles could disappear in about a day. I didn’t exercise, so I spent most of my time sitting in bed watching TV with junk food. I would even try to hide the food so that nobody would know exactly how much I was eating. I would often skip breakfast and then be hungry later, which would lead to me grabbing whatever to eat. I also drank a lot of juices and carbonated drinks. 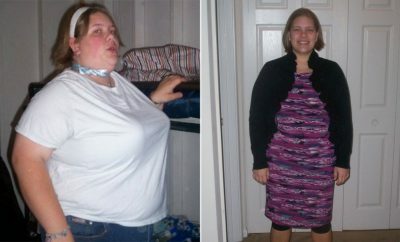 By the end of 2009, I was wearing a size 18 or 20 and was not healthy at all. I was 5’10” and weighed 265 pounds. I hated the way that I looked and felt. I was also really top heavy (I was at a 40H) and had always been, even at my smallest weight. This led to chronic back pain, shoulder pain, neck pain. I was seeing a chiropractor three times a week and taking muscle relaxers and prescription pain medication. Breaking Point: I knew I needed to do something for myself. I couldn’t stand the constant aches that my weight contributed to. I wanted breast reduction surgery, but knew I needed to lose some weight before I could even make that happen. 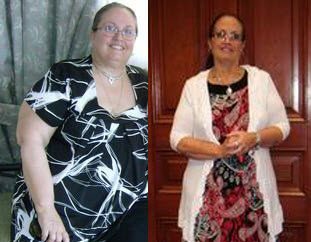 My goal was to have the surgery in 2010, so in January 2010 I started on a low-carb diet and walking two miles a day at work. 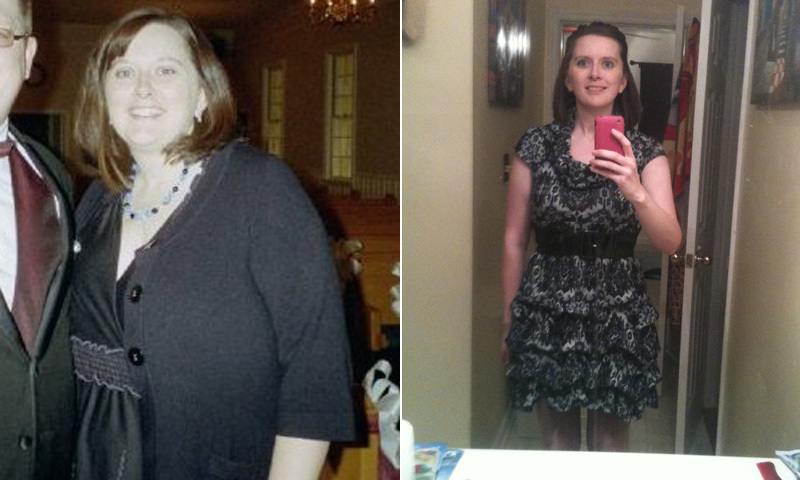 How I Lost It: By May, I had lost 51 pounds and finally had my consult for surgery. In August 2010, I had my breast reduction surgery, which reduced my weight by another 10 pounds (that was the weight they took off). After the surgery, I really didn’t keep up with the change in diet and went back to eating what I normally had, although I did continue to walk two miles a day. I wound up putting back on about seven pounds and maintained this weight through 2011. In February 2012, my office decided we were going to participate in a Biggest Loser challenge. I decided that this might be what would jump-start my weight loss again. I downloaded several calorie counting apps on my phone and started keeping track of what I was eating. My eating habits drastically changed. I incorporated more fruits and vegetables into my diet. The fried foods went away, the chips went away. I starting buying high-fiber, low-calorie breads and other lower-calorie foods. I tried and continually try to eat fewer “bad” carbs and just stick to the “good” carbs. I cut out the carbonated drinks and the juice and went strictly to water. I had to learn exactly what I had been putting into my body. I also taught myself that if I knew I was going to eat something that wasn’t as good for me to exercise more that day. I figured out that, for me, I need to eat more frequent, smaller portions of food so that I don’t get hungry during the day. I learned that if my body is craving a certain food, I should eat it, but just enough to get rid of the craving. I’ve learned that you can’t deprive yourself, because that’s all you will think about and wind up binging on that one thing. 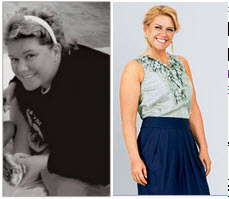 RELATED: Real Weight Loss Success Stories: Barb Decided Enough Was Enough And Shed131 Pounds! I started out setting out to lose two pounds per week. We had to weigh in every week, which was motivating for me. I started eating better and working out more because I could actually see how many calories I was eating and how many I was burning off. My weight slowly started to decrease. By May 2012 I was down to 190 pounds (couldn’t remember the last time I had been under 200) and decided to do my first 5K race. After that, I did six more races throughout the year. I also started Zumba, and doing more than my normal walking. I felt so good about myself, and the weight kept coming off. I would set small goals for myself and when I reached one, I would make another one. By Christmas 2012, I was down to a size 10 and weighed 155 pounds. My final goal was to be 145 pounds. It sounded like a number that would be easy to maintain. In the beginning of February 2013, I hit that goal weight. Two weeks later, I was at 143 pounds and now I wear a size 8. 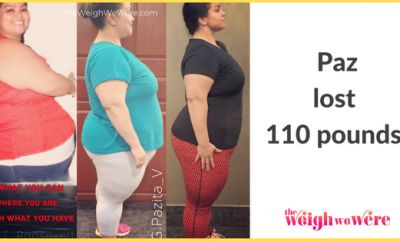 That’s a 122 pound weight loss for me. I have never been this small, but I am also the healthiest I have ever been. I have so much energy and I don’t get winded easily. I finally feel good about myself and I am so proud that I was able to accomplish this goal. I want this to be ME some day!!!!!!!!!!!!! CONGRATULATIONS!!!! So awesome! She does indeed look amazing! You look AMAZING!!!! Congratulations!!!! I love the idea of a Biggest Loser challenge at the office. My Co- workers and I have been looking for something that would really keep our motivation up and I think this might be the kick in the pants that we need to keep eachother going. Thanks for sharing. That’s awesome. Congrats to you. I started my weight loss journey 2 weeks ago, i was at 255. Yesterday i am sy 252.